Azaleas /əˈzeɪliə/ are flowering shrubs in the genus Rhododendron, particularly the former sections Tsutsuji (evergreen) and Pentanthera (deciduous). Azaleas bloom in the spring (May and June in the temperate Northern Hemisphere), their flowers often lasting several weeks. Shade tolerant, they prefer living near or under trees. They are part of the family Ericaceae. Azaleas are generally slow-growing and do best in well-drained acidic soil (4.5–6.0 pH). Fertilizer needs are low. Some species need regular pruning. Azaleas are native to several continents including Asia, Europe and North America. They are planted abundantly as ornamentals in the southeastern US, southern Asia, and parts of southwest Europe. 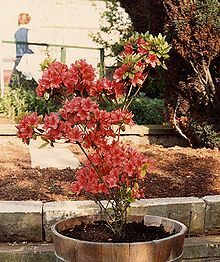 According to azalea historian Fred Galle, in the United States, Azalea indica (in this case, the group of plants called Southern indicas) was first introduced to the outdoor landscape in the 1830s at the rice plantation Magnolia-on-the-Ashley in Charleston, South Carolina. From Philadelphia, where they were grown only in greenhouses, John Grimke Drayton (Magnolia's owner) imported the plants for use in his estate garden. With encouragement from Charles Sprague Sargent from Harvard's Arnold Arboretum, Magnolia Gardens was opened to the public in 1871, following the American Civil War. Magnolia is one of the oldest public gardens in America. Since the late 19th century, in late March and early April, thousands visit to see the azaleas bloom in their full glory. In Chinese culture, the azalea is known as "thinking of home bush" (sixiang shu), and is immortalized in the poetry of Du Fu. The azalea is also one of the symbols of the city of São Paulo, Brazil. Azaleas and rhododendrons were once so infamous for their toxicity that to receive a bouquet of their flowers in a black vase was a well-known death threat. In addition to being renowned for its beauty, the azalea is also highly toxic—it contains andromedotoxins in both its leaves and nectar, including honey from the nectar. Bees are deliberately fed on Azalea/Rhododendron nectar in some parts of Turkey, producing a mind-altering, potentially medicinal, and occasionally lethal honey known as "mad honey". According to the ancient Roman historian Pliny the Elder in his Natural History, an army invading Pontus in Turkey was poisoned with such honey, resulting in their defeat. Motoyama, Kōchi also has a flower festival in which the blooming of Tsutsuji is celebrated and Tatebayashi, Gunma is famous for its Azalea Hill Park, Tsutsuji-ga-oka. Nezu Shrine in Bunkyo, Tokyo, holds a Tsutsuji Matsuri from early April until early May. Higashi Village has hosted an azalea festival each year since 1976. 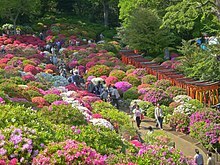 The village's 50,000 azalea plants draw an estimated 60,000 to 80,000 visitors each year. The Azalea Society of America designated Houston, Texas, an "azalea city". The River Oaks Garden Club has conducted the Houston Azalea Trail every spring since 1935. ^ The World Book encyclopedia. Chicago: World Book. 2004. p. 995. ISBN 0716601044. OCLC 52514287. ^ "Home & Garden Information Center - Clemson Cooperative Extension - Clemson University, South Carolina". www.clemson.edu. Retrieved 22 June 2018. ^ Benson, D.M. "Azalea Diseases in the Landscape". Plant pathology extension NCSU. North Carolina State University. Retrieved 27 January 2011. ^ Municipal law of the city of São Paulo nr. 14472 of 2007. ^ "Stopping to Smell the Rhododendron | Natural Selections". selections.rockefeller.edu. Retrieved 2016-11-02. ^ "University of Pennsylvania's Poisonous Plants Home Page". Archived from the original on 2012-03-17. ^ "The Strange History of 'Mad Honey' - Modern Farmer". modernfarmer.com. 4 September 2014. Retrieved 22 June 2018. ^ Pliny. Natural History. p. 24.90. ^ Pliny. Natural History. p. 21.77. ^ "Native Azaleas in Hong Kong" (PDF). ^ "Ma On Shan Azalea". ^ "North Carolina Azalea Festival - A Scene to be Seen!". North Carolina Azalea Festival. Retrieved 22 June 2018. ^ "FLAZALEAFEST.COM". www.flazaleafest.com. Retrieved 22 June 2018. 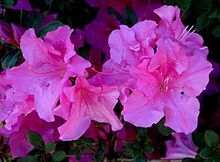 ^ "Pickens Azalea Festival". www.pickensazaleafestival.org. Retrieved 22 June 2018. ^ "City of Mobile, Azalea Trail Maps". "Azalea" . Encyclopædia Britannica (11th ed.). 1911.